This is the same on both Chrome and Safari on a mac, and the chrome web browser on a (old) Nexus 7 tablet. I run the ODK aggregate VM in bridged mode in Virtualbox, and everything is connected together using a TP link router which is not connected to the internet. The TP link router gives a static IP address to the VM, based on its mac address. I have run the aggregate-config command in the aggregate command line. What steps can we take to reproduce the problem? I think the problem is in my network setup, so it will be hard to replicate. Restarting the VM/Router/computer several times, tried several alternative browsers. Can you check the resources (memory, cpus, etc.) you've assigned to the VM? Did you restart the VM after setting it in bridge network and running aggregate-config? I looked at the resources (see picture attached). It gets 1024 MB of memory and is allowed the full usage of one CPU core. I think that should be enough. These were the default settings of Virtualbox. I restarted the VM after putting it in bridge mode and running aggregate-config. 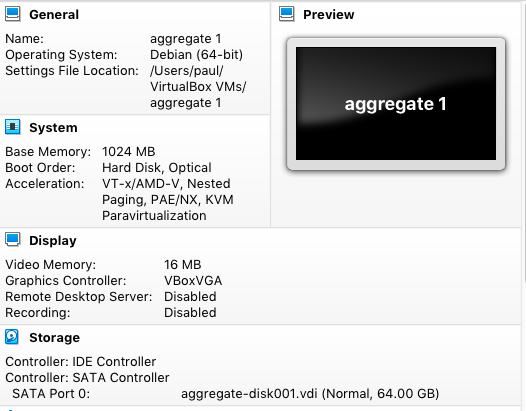 Normally, the first time accessing Aggregate could be slow-ish, but the rest should go just fine with your VM settings. The next step would be to check Tomcat's log file at /var/logs/tomcat8/catalina.out. It would be great if you could attach it to this thread. Some comments ago you mentioned some issues with your network setup. Maybe if you describe them we can sort this out. Thanks for the quick reply! I'm not sure how to access this file. I'm using the Virtual Machine so I didn't really go through the nitty gritty of setting aggregate up. About the network setup, I have the feeling that using the server/VM as I do, without an internet connection, is not really expected user behavior, so that could be causing some issues. I'm using the Virtual Machine so I didn't really go through the nitty gritty of setting aggregate up. That makes total sense. You shouldn't have to if you're using the VM. without an internet connection, is not really expected user behavior, so that could be causing some issues. Unfortunately I didn’t have time to troubleshoot this further. Going back to an earlier version of the VM (1.4.7.1) got it working well without an internet connection. Thanks for the help!